Over a period of 18 months, Davies researched for the Guardian a special series of stories investigating the condition of our state schools. They were published in three batches between September 1999 and July 2000, at lengths varying from 600 words to 7,000. 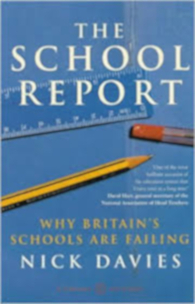 The series attempted to go beneath the surface issues to expose the fundamentals – the undeclared but highly successful policy to kill off our comprehensive schools; the bogus analysis of school failure used by Ofsted; the fabrication of facts by Ofsted’s chief inspector, Chris Woodhead; the gross dishonesty about funding by the Secretary of State; the link between the success of private schools and the failure of state schools; graphic stories about underfunding, about the lives of truants; an expose of how teachers have joined children in cheating to deliver the exam results which the government demands; some pointers to solutions, based on Dutch schools. The response was huge. First published by Chatto & Windus (Random House, UK) in 1999. David Hart, general secretary of the National Association of Head Teachers. Sir Peter Newsam, chief schools adjudicator. David Blunkett, secretary of state for education at the time the book was published.